Team USA departing Princeton Boathouse headed for 2013 World Championships. Team USA has officially arrived in Chungju, South Korea. The journey began early Wednesday morning with a two-hour bus ride from Princeton to JFK International Airport. The anticipation and excitement could be felt among the group as people seemed to be extra chatty–or perhaps it was just because I was sitting next to an over-caffeinated Mike Gennaro (stroke of the Men’s 4-). After a long and rather sleepless 14-hour flight from JFK to Incheon International Airport in Seoul, South Korea, we endured another two-hour bus ride heading southwest to the city of Chungju. Unsurprisingly, this bus ride was a bit quieter than the ride some 20 hours earlier. As the buses pulled into and began unloading at the IBK Training Center, our residence for the next two weeks, the energy of the group was revived by an enthusiastic and boisterous welcoming party chanting “U-S-A! U-S-A!” and waving the American flag. Holding up a huge banner, “Welcome to Chungju USA”, they continued to chant and clap for us as we walked into the lobby. It was humbling yet uplifting to be greeted so warmly by the local staff. I’m not sure I’ve ever made an entrance like that. The IBK Training Center is absolutely beautiful. Set in the lush, green hillside along the banks of the Chungjuho lake, the campus itself is immaculate and pristine, surrounded by an impeccable layout of gardens and open space. Basically, we’re staying in a pretty amazing place. The staff couldn’t be nicer and the food is actually pretty decent. Great Britain, Germany, and Australia join team USA at the IBK, while other countries are scattered at various resorts and hotels around Chungju. A few days later and we’re finally adjusting to the time difference, shaking off the jet lag and remembering how to effectively move a boat. The facilities at the race course are just as impressive. Aside from a pretty wicked cross wind, I have no complaints. South Korea definitely knows how to welcome the World. 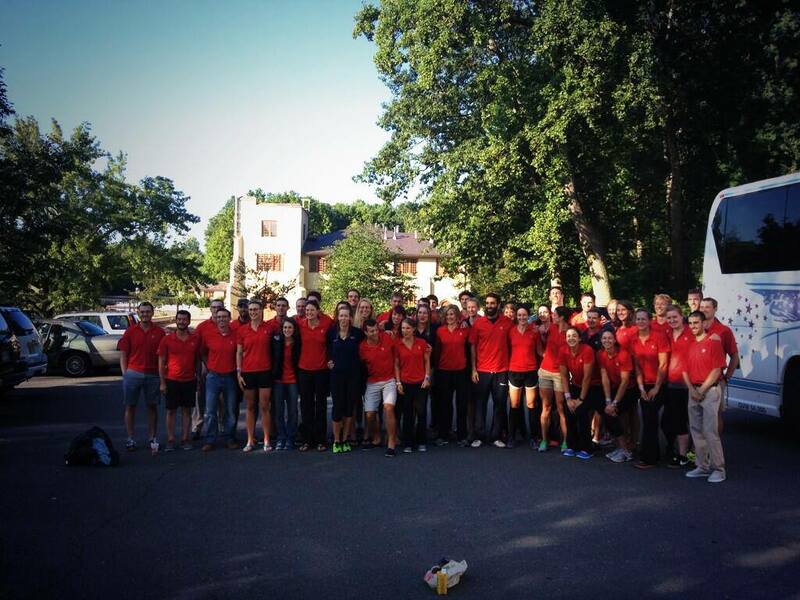 We’re all excited and proud to be here, representing the USA at the 2013 World Rowing Championships. We still have a lot of days ahead of us before racing begins, but it’ll be here before we know it. Here’s to fast racing and bringing home some hardware. Congrats on your hardware from Switzerland! That was so awesome to hear about and share with you! Good stuff! I always think I’m going to call you and talk in person and before I know it, it’s weeks later, and now you’re in South Korea! I am so excited for you and all of these wonderful experiences! Keep working hard, and even though we don’t talk as often, I’m thinking of you and wishing you strength, speed and wellness! 🙂 do you say “break a leg” in rowing??? Looking forward I the next update!